This past summer, a slew of new buzz for Elysium arrived after some promising footage was screened at Comic-Con, an interesting viral campaign kicked off and we interviewed director Neill Blomkamp about his mysterious sci-fi film. 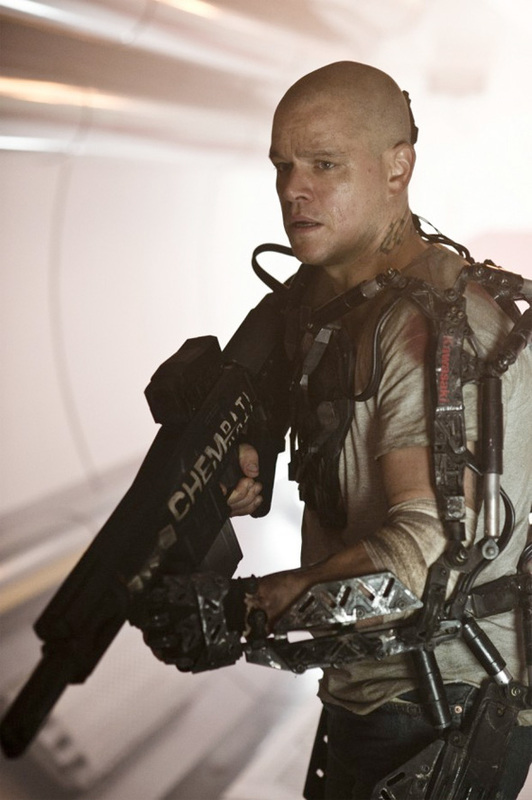 We've only seen one official photo of Matt Damon in the film wearing some sort of robotic arm and weapons, and now another one has arrived that is essentially more of the same. The film was pushed back to a release next August, but hopefully with this new photo coming from Sony, that means the first trailer for the film isn't too far behind. We're definitely interested to see a lot more. Look below! In the year 2159 two classes of people exist: the very wealthy who live on a pristine man-made space station called Elysium, and the rest, who live on an overpopulated, ruined Earth. Secretary Rhodes (Jodie Foster), a hard the government ofﬁcial, will stop at nothing to enforce anti-immigration laws and preserve the luxurious lifestyle of the citizens of Elysium. That doesn’t stop the people of Earth from trying to get in, by any means they can. When unlucky Max (Matt Damon) is backed into a corner, he agrees to take on a daunting mission that if successful will not only save his life, but could bring equality to these polarized worlds. Neill Blomkamp writes directs Elyisum and Sony sends the film to theaters August 9th, 2013. Damn that looks good! Love the enhancement suit he is wearing. Hope the trailer wont disappoint. "Kawasaki" on the super suit. Looking awesome. Badass! i want to a trailer soon! PACIFIC RIM and ELYSIUM will own 2013. Bring it on!!! Not that I know of. Still Elysium (here in the US) as far as I know, but something could change before that August late-summer release.